This kitchen felt very small and dark at the beginning of the design. One of the key features was to add more light (which we did in spades) and increase the work-able area of the kitchen. The overall kitchen footprint remained nearly unchanged and yet, much space was added. This was achieved by removing one closet, moving a washer and dryer, and pushing back a bay of cabinets by six inches. Altogether these three changes created a kitchen which has room for many to work comfortably in. The cabinets designed for this kitchen were created from maple, treated with Zar Provencal stain, and Duravar Satin clearcoat. 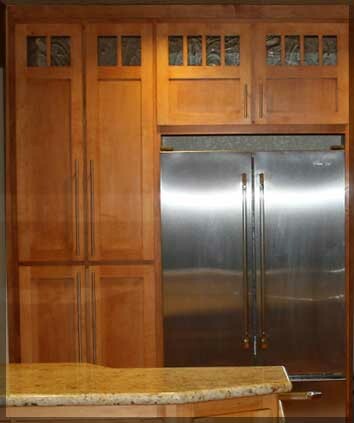 The doors for this kitchen were custom made by Dutchman Doors from Tracy, CA. Doors designed in AutoCAD were provided to the company and custom glass was procured from Woodland glass for the accent lights in the top of each door. In these before pictures you can see just how dark and small the kitchen felt. 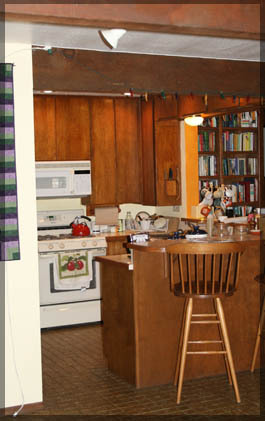 Originally there was a closet and refrigerator to the left which blocked the overall view of the interior of the kitchen (this was the closet which was removed). 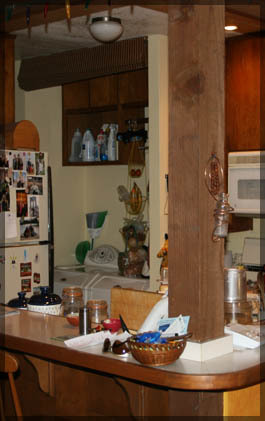 The washer and dryer were located directly next to the stove thereby taking away from the useable space for the kitchen. These two units have since been changed to a stack-able configuration which resides in a closet. 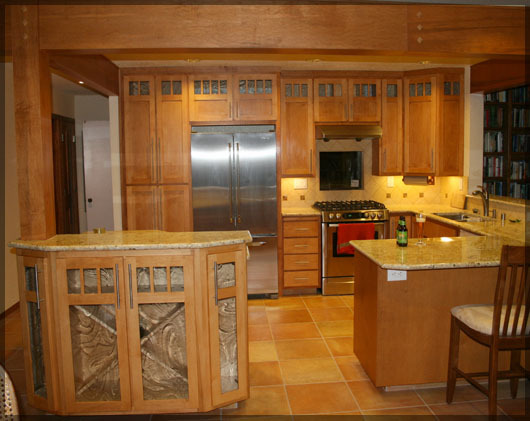 In the after photos, you can clearly see that the light and open feel of the kitchen has been enhanced dramatically. 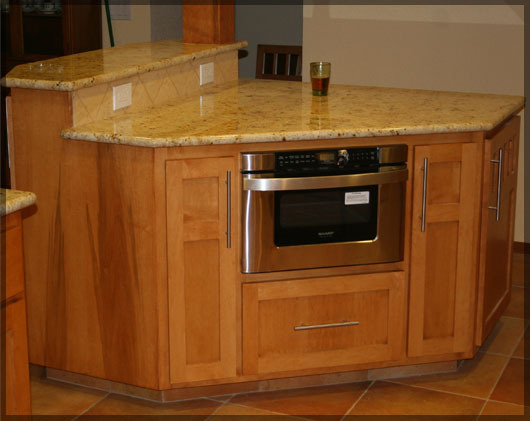 A newly custom designed island contains wine bottle storage and the counter surface tot he right has been designed as a buffet space. The space where the original washer and dryer were has been changed to include pantry with pullouts and the refrigerator. A window has been added directly behind the stove which is a custom stained glass design by Sacramento Glass Works. 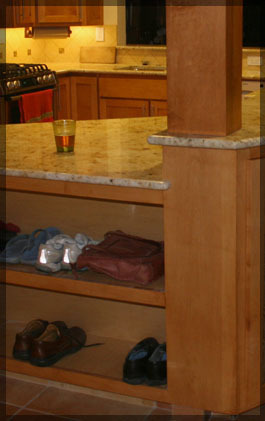 The island contains an area for shoe storage (which happens to be directly in the entry way from the carport door), a spice pullout, and drawer microwave. All of the tile and slab work completed throughout the kitchen was performed by our friends at Tileco (now known as Genesis Tile); including the wonderful advent of the tiled toe kick which makes cleaning easy! One of the last custom features of this kitchen include a beam design for the ceiling. The original structural support for the second story had Redwood beams which needed to stay in place and even additional engineered beams which needed to be added due to the removal of the closet and wall. These two structural supports looked very different and needed to be brought together with a surface treatment which made them appear to have craftsman style pins and half lap joints. This proved to be very tricky as both beams were considerably different in size. The newer engineered beam needed to be artificially increased in size to create the desired look.